Can a debt collector take your Social Security benefits? Can they do that? Nope! At least not with respect to your Social Security benefits . . . and as for the rest of your bank accounts, it depends. In any event, be careful. The usual way for a creditor to collect on a debt, short of simply bullying you or shaming you into paying up, is to sue. Once the creditor obtains a judgment for the debt, the usual strategy for collecting is to either garnish a part of income or levy on the bank accounts of the debtor. What if the debt is just one spouse’s? Often older couples come to a late marriage with their own debts, and they agree to keep their finances separate. If each spouse truly keeps his or her affairs separate and does not contract a debt along with the other spouse, or in some way guarantees the debt, the nondebtor spouse is not responsible. Usually. Some states use the old English “Doctrine of Necessaries.” North Carolina is one of them. Under that doctrine, a spouse can be responsible for the debts incurred for goods and services that were necessary for the health or well-being of the debtor spouse. Medical expenses are chief among those. Even if the Doctrine of Necessaries applies, though, Social Security benefits rate a high level of protection. 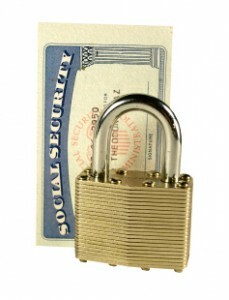 Generally, under federal law creditors may not touch Social Security benefits. Two notable exceptions apply. The benefits remain subject to alimony and support payments, and, of course, to federal tax liabilities. But other than those: Hands off! That’s not the end of the story. It has to be handled right. While Social Security benefits are always exempt from general creditors as they are paid, whether the payments that are not spent and that are deposited into an account remain protected after deposit depends on a number of factors. If the funds have been commingled with other funds (maybe general savings from company pension plan payments) they’ll lose their protected status. If the funds are “pure” Social Security payments that have accumulated in an account the funds theoretically are protected. I say “theoretically” because you will need to prove to a bank that there are no other funds at all in the account. That may be difficult. The best time to make that proof is in front of a judge when you or a spouse is getting sued . . . but that doesn’t always happen. Talk to the bank and ask them ahead of time. Of course, you may feel a bit funny doing that. Stuff like that makes some bankers nervous. Change from automatic electronic deposit to Social Security’s Direct Express® debit card. This is a debit card issued by Social Security . . . and you don’t even need a bank account. Go to the Social Security website for more information and how to sign-up for, or switch to, Direct Express® debit card. If you don’t want to bother with that, call 800-722-1213.